a file to perform each function. 1050, XF551 and compatible disk drives. 3. Handles up to 4 disk drives plus a ramdisk plus up to 8 concurrent files. of the disk in the drive. vice versa) with only one drive. 8. Short SYS files allows maximum use of disk space and memory. 9. Variable XL/XE key delay and repeat rate. Bucholtz, Newell, or RAMbo with 180K. Enables instant loading of files. the resident program is saved. No MEM.SAV waiting. 13. Use single keystrokes to list drrectory or select items. SYS files except DOS.SYS using wildcards. SuperMAX, US Doubler or Atari XF551. 17. Copy sectors and display bad sector numbers. Copy only the used sectors. same density as the source disk. 19. Enter sector numbers in hex or decimal. Default is hex use # for decimal. 20. Write with or without verify. Toggled from SDUP menu. 23. Annoying Atari 4 line scroll removed. 24. A red screen border indicates next operation may write to the disk. of copy file disk or sectors. 26. A binary save that even saves carts. 27. 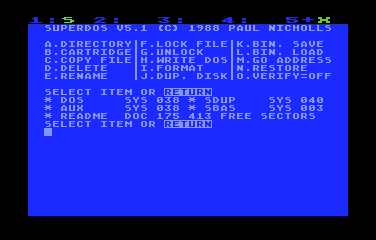 A copy from DOS 3 using 1 or 2 drives and wildcards. run the bin file you choose. 30. Trace and link data of files and patch around bad sectors. 31. Option to display deleted or open filenames. 32. Alter the number of open file or drive buffers from the AUX menu. menu on 400/800 or option to disable the ramdisk. 35. I/O defaults to the ramdisk if one is available. 1. (S)INGLE – 720 sectors of 128 bytes. 810 format. 2. (E)NHANCED – 1024 sectors of 128 bytes. 1050 format. 3. (D)OUBLE – 720 sectors of 256 bytes. SuperMax, Us Doubler, Happy format. 5. (2) SIDES – 1440 sectors of 256 bytes. Atari XF551 format. SuperMAX or Atari XF551 and the baud rate is adjusted. RAM under the OS or in the ramdisk. the “.RAM” extention are copied to the ramdisk. Press BREAK to abort it. The same thing happens no matter how much RAM your Atari has. area. If it is then the DOS menu appears instantly. 2. If SDUP.SYS in not in RAM then it is loaded from drive 1.
are available and the density of each of them. At the prompt “SELECT ITEM OR RETURN” the following commands are available. Only one keystroke is required. #1-4 List the directory of drive 1 to 4. #5-8 List the contents of the ramdisk. have some info you have not seen before. “? OPEN .TXT 000″ File opened but never closed. B. CARTRIDGE XL/XE users have the option of enabling or disabling BASIC. 1. You may enter one OR two filenames seperated by a comma. b. Enter two filenames for two drive copy. between densities with one drive. CLOAD and CSAVE. To specify long IRG use /L. other key to go onto the next file. need to be careful not to specify a file that already exists. only. Just follow the prompts. Double, Extended or 2 sides. Follow the prompts. thus allowing extremely fast read/write speeds. COMMANDS for ramdisk formatting details. disk. The formatting density is taken from the source. provided your ramdisk can match the density of the disk. 6. A red or green border indicates the next read/write. K. BIN. SAVE Same as DOS 2. Memory addresses may be decimal. eg #20788. You can even save roms without error. M. GO ADDRESS Memory addresses may also be decimal. destroyed when the program area is destroyed. the error will be restored and you’ll see an error message. and write without verify “P”. #. LIST DIRECTORY Type 1 thru 8 to list the directory of drives 1 to 8.
to initialize DOS. This will destroy any BASIC programs. used exactly as the C. COPY FILE command. R. WRITE SUPERBIN For a description of SUPERBIN see WHAT IS SUPERBIN? delete “DOS.SYS” and “SDUP.SYS” as they are not used. command merely displays this information to the screen. to write the DOS files. you’ll need to write the DOS files. process the ramdisk is to be initialized. Y. RESIDENT SDUP Toggles between the resident and non-resident SDUP. the user program will be destroyed. instantly. Unfortunately this also means less memory. SDUP for your own use (see Memory Map for addresses). Z. EXIT TO SDUP Returns you to the SDUP menu. 0 $00 Format in the current density of the drive. 34 $22 Format in enhanced density. AUX3, AUX4 (skew table) and FILENAME DATA. available in enhanced) with skewed sectors. 0 $00 Format ramdisk using maximum density and memory avail. 1 $01 Format ramdisk single density, 64K, 502 free sectors. 2 $02 Format ramdisk single density, 90K, 707 free sectors. 3 $03 Format ramdisk enhanced density, 128K, 1011 free sec. 4 $04 Format ramdisk double density, 180K, 707 free sectors. 5 $05 Format ramdisk Xtended density, 256K, 1011 free sec. 128 $80 Format but don’t write boot sectors, VTOC or directory. boot sectors, VTOC or directory. Used only if bit 0 set in AUX2 and if the disk drive has a config. “D:H? ?RADA@” Set 2 sides, double density. Note: # represents an inverse @. allowed. You will fill the rest of the disk with your binary load files. appropriate key and the file is loaded and exectued for you. 1. Format a disk and write DOS.SYS only. 3. Copy your BASIC programs onto the disk. 4. Rename the BASIC programs with exteners to filenames without extenders. 5. Lock the programs you wish to be displayed on the menu. of memory you have available. 64K free (ie the normal 130XE RAM) by pressing ESC during the boot process. but all IO is diverted to the ramdisk. 2. Turn drive one on to use it again. 8C00-BFFF RAM User program area or screen display. * Varies according to the number of drive and file buffers allocated. that use illegal entry points to run. 2. Two new vectors have been added to Superdos. $07DD – SIO superspeed and ramdisk vector. WRITE “W”. Entry: Parameters in DCB. Set DUNIT to 5-8. Exit: status in DSTATS ($0303).